Bank of America promises it will show local commitment to Chicago...by bringing back the Sun-Times building. - Trade magazine Restaurants & Institutions has created a list of the top ten best recalled restaurant ads. - If you want ad banners, AdFresh has them. I thought we already had BannerBlog? - Bank of America is on the hunt for a new media shop. Ad consultant Select Resources International will handle the review. - Scotland actually paid money for it's new tourism tagline: Welcome to Scotland. 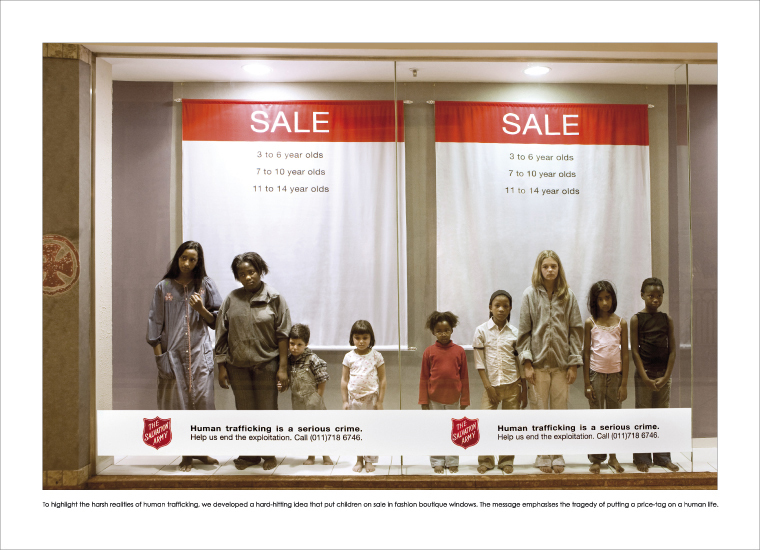 To add a personal face to human trafficking, Leo Burnett, South Africa put young children on the auction block in shop windows for its client, The Salvation Army. See variation here. The children do not look amused. This isn't the first time kids have been put in windows, but we've previously seen the idea in cheerier settings.